If you look at a map, it’s hard to see why Idaho wouldn’t grow wine grapes about as well as eastern Washington. Until recently, it wasn’t close, except geographically. Today, better viticulture, an influx of talent, and global warming are contributing to an increasingly interesting Idaho wine scene. There’s good Syrah, Viognier, Cabernet, Mourvedre: basically, the same good assortment you get from Columbia Valley. Precept Wine, the savvy Washington company behind House Wine and Waterbrook, has made a major investment in Idaho in the past three years, buying the state’s two largest wineries. Precept isn’t in the wine business for the glory; its owners believe Idaho wines have a lucrative future. Yet less than a decade ago, the state of Idaho wines was bleak. “Our reds were just atrocious. Very vegetative,” says grower Ron Bitner, who planted his vineyard in 1981. The main problems were perception and farming. Wine grapes were planted in Idaho in the 1860s, but as in most states, the industry was wiped out by Prohibition and no grapes were replanted until the 1970s. At that time, people thought Idaho = skiing = cold. So farmers planted riesling. Note that I said “farmers,” not grape growers. That’s because even now wine grapes are just another crop in the main growing area, Sunnyslope, alongside fruit trees, wheat, onions and corn. In fact, one farmer recently tore out a large vineyard to plant wheat—unheard of in most of the wine world. Once grapes become the best way to make money in an area, few farmers ever turn back. In those older vineyards, wheat and grapevines were treated basically the same way: watered from above the plant, with as much water going to weeds as the vines. Two events ten years apart changed everything. First, viticulturist Richard Smart came in the early 1990s and told everyone that the Snake River Valley isn’t as cold as its reputation. In fact, with its high elevation, extreme dryness, short growing season, hot summer and diurnal temperature variation, it is most like northern Spain, and farmers should be planting tempranillo. That piece of advice still hasn’t widely caught on. Smart also told farmers they should trellis their vines and position the shoots vertically, instead of letting them grow whatever way they came out of the ground like a fruit tree. Here, some people listened. Bitner, a scientist who studies leafcutter bees, replanted his whole vineyard. Then, ten years ago, Sawtooth Winery’s owners planted the 300-acre Skyline Vineyard, a state-of-the-art vineyard with drip irrigation and tight spacing and everything else that major vineyards in California and Washington are doing. Skyline wouldn’t be groundbreaking elsewhere. It was proof of much of what Smart preached, and the improved fruit quality was obvious to everyone. And Skyline is still nearly 20% of the 1,600 acres planted in the entire state. The last element to the equation was outside-trained winemakers. It’s striking how often I heard this story: a young woman, born in Idaho who learned to make wine elsewhere, came back home for the quality of life, now that the grapes are better. That’s Melanie Krause of Cinder, who was assistant winemaker for Chateau Ste. Michelle, Washington’s biggest winery. 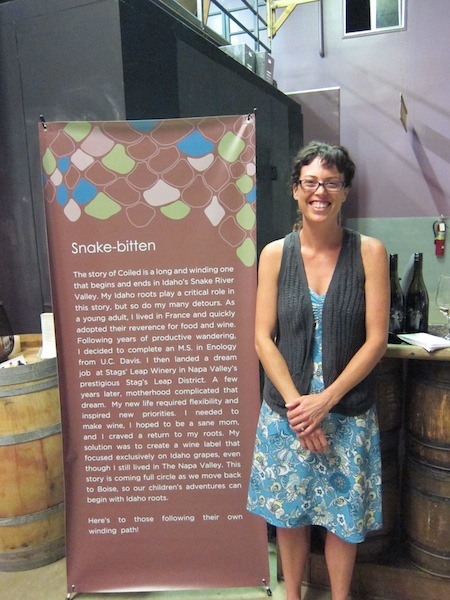 That’s Leslie Preston, who left her job as enologist at Stags’ Leap Wine Cellars to run the one-woman winery Coiled. And that’s Angie Riff of Périple, who was assistant winemaker for Helen Turley for four years. An interesting aside is that all three of these women met their husbands outside Idaho and later moved back with him: worth noting for men who meet women from Idaho. “We had a lot of friends in Napa and we liked it there,” Preston says. “But the outdoor life, it’s not the same. I like to run outside, hiking, biking, skiing. I like it all.” Preston also likes the fact that, unlike in California, Idaho restaurants are still excited when a local winemaker walks in to sell her wares. The competition isn’t fierce. Ten years ago, Idaho had 11 wineries. Now there are 47, but other than Precept-owned Ste. Chapelle (130,000 cases) and Sawtooth (15,000 cases), they’re all small. First, while the climate is good for a variety of fast-ripening grapes, spring frost is a major problem that means you will have to replant some vines eventually. Third, while Boise is less than an hour’s drive away, the main viticultural area in Sunnyslope is culturally, well … while I was there, the main town of Caldwell boasted a billboard comparing President Obama to the Colorado movie-theater shooter. Unfavorably. There’s one restaurant everyone goes to, the Orchard House, and it specializes in burgers. And when I was lost and couldn’t find Fujishin Family Cellars, I stopped into a gas station. The owner had never heard of Fujishin (“It’s a winery,” I said) and looked at me suspiciously. Turned out I was less than 2 miles away. Boise, though, is one of the nicest small cities in the country, with a great combination of a healthy lifestyle, good entertainment options, and friendly people. “This is a great place to live,” Fraser says. “I’m from Houston, Texas. I would never go back.” Shocking admission from a Texan. But Boise’s best wine shop is a co-op with a wide-ranging international selection at decent prices. Whitewater rafting is an hour away. And while meat and potatoes are omnipresent, it’s not hard to get a grilled kale Caesar salad. Can I have a Snake River Valley Viognier with that? 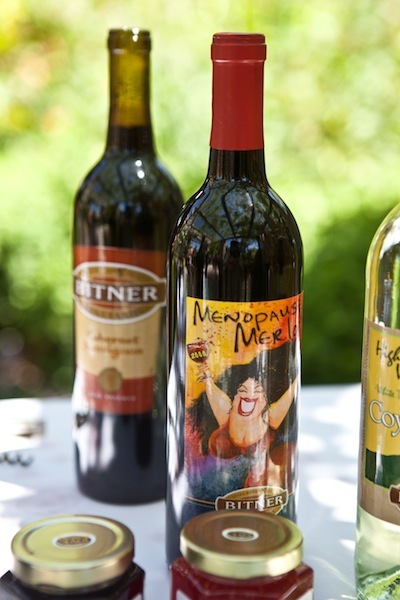 Initially spicy, this wine rolls out some brambly berry on the midpalate before finishing with surprising restraint. But that may be the character of Idaho Petite Sirah; the grape is a beast in California but most Idaho versions are more delicate. 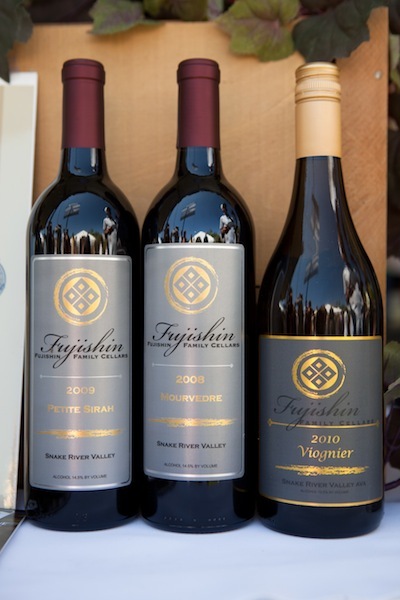 Winemaker Martin Fujishin manages several vineyards and buys all his grapes on the spot market. “The trick to buying grapes on the spot market is to run the harvest crew,” Fujishin says. It’s 14.5% alcohol. 90 points. What a bottle of wine for $11. This wine was harvested early enough to qualify as cool-climate, barrel-fermented in 100% new oak, with lees stirring and no malolactic fermentation. It tastes like that sounds: Leesy, with toasty notes, decent acidity and nice melon fruit underneath. I asked winemaker Maurine Johnson, “How can you do 100% barrel-fermented wine with lees stirring for $11?” She said, “You can’t. So we’re going to have to figure something out.” Ste Chapelle changed ownership after this wine was made, so enjoy while you can one of the best wine values not just in Idaho, but in the entire United States. 13.5% alcohol. 90 points. 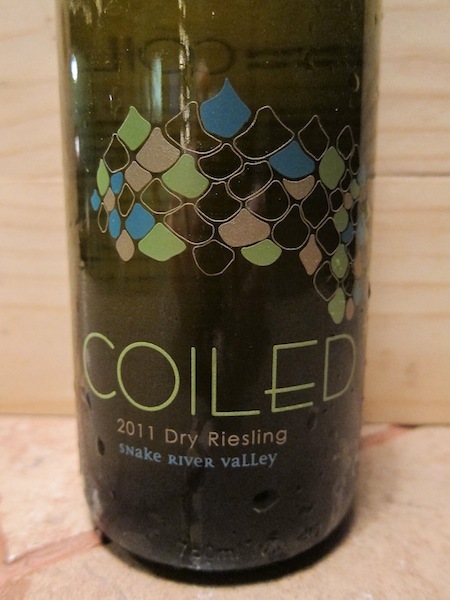 Not many Idaho vintners are making dry Riesling. Ron Bitner spent 10 summers in Australia at his regular job, helping to introduce colonies of leafcutter bees. He developed a taste for dry Riesling and asked winemaker Greg Koenig to make it from Bitner’s grapes. It’s very successful: crisp and lively, with nice apricot fruit, a lean body and a clean finish. Just 12.6% alcohol. 92 points. Not many people are growing Pinot Noir in Idaho. Tammy Stowe-McClure’s parents planted in 1982, when people thought Idaho was colder than the summers actually are. But the wine works for people who like to let Pinot be Pinot. It’s light-bodied, with raspberry fruit and high acidity. It reminds me of mid-price Pinot Noir from Chile’s Casablanca Valley in that it’s not complex, but it’s charming and I can (and did) drink the heck out of it. 13.4% alcohol. 89 points. 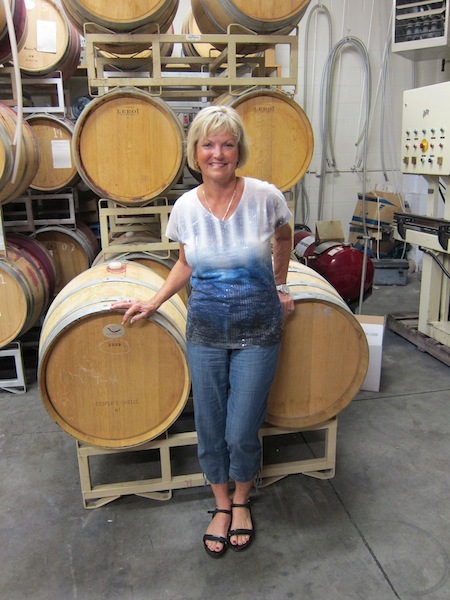 Melanie Krause came home to Idaho after running quality assurance in vineyards for Chateau Ste Michelle in Washington. 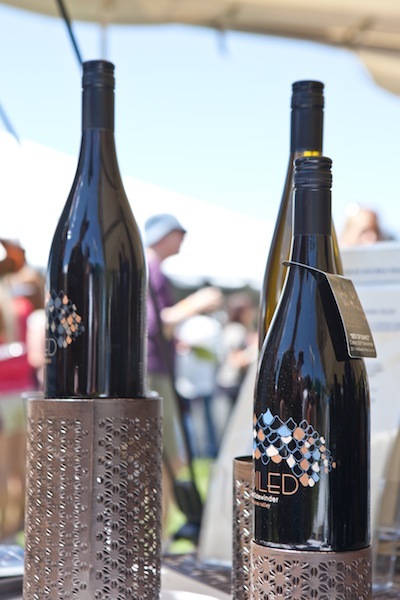 With the 2011 vintage, she began making dry and off-dry versions of the Viognier, harvesting at different times. I don’t like either of those as much as this one, perhaps because it combines the best aspects of the fruit for both, but I must add that this was one of my favorite Viogniers in the state. It’s straightforward and lively, with pure-tasting apple fruit. 14.1% alcohol. 90 points. This is Leslie Preston’s first white wine after 5 years of commuting from her day job as enologist at Stags’ Leap Winery to make Syrah in her home state. With 0.6% residual sugar, it’s a tad sweet for “dry,” but she says, “Next year I’m going to go a little drier with it.” It’s a great start; vibrant, with plenty of ripe apricot and white peach. 12.8% alcohol. 91 points. *Editor’s Note: Additional tasting notes will be published and linked here later in the week. Welcome to Idaho, still kinda like turning back time, isn’t it? 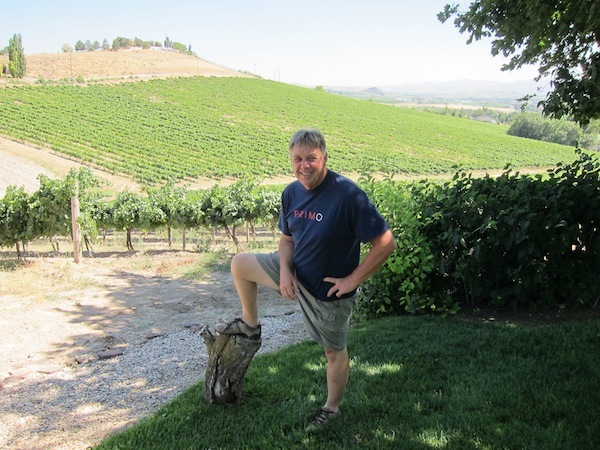 Mark is from northern Cali, Napa area so he thought Idaho wines were nothing to talk about when he came here. 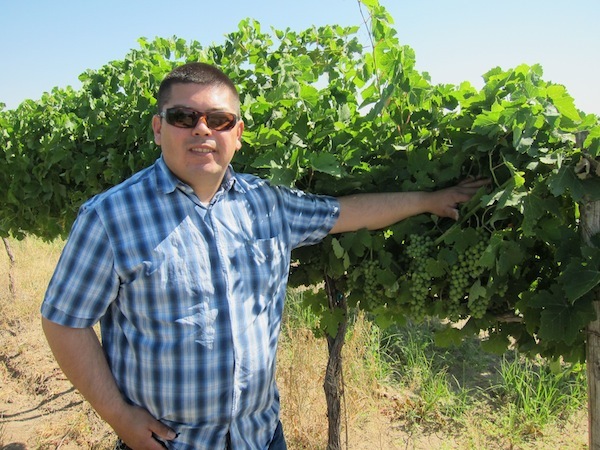 We live near the Sunnyslope area and the wines are getting better and better in this area and Idaho. Thanks for the article and will look forward to reading more in the future. Living in Boise makes it an easy 40 minute drive to the Sunnyslope area with it’s wonderful selection of wineries, a must do outing whenever we have out of town guests! I am always so surprised when locals are unaware that we have a great wine area practically in our backyard! And as Jan said the wines just keep getting better & better! Idaho is a great region with huge promise. 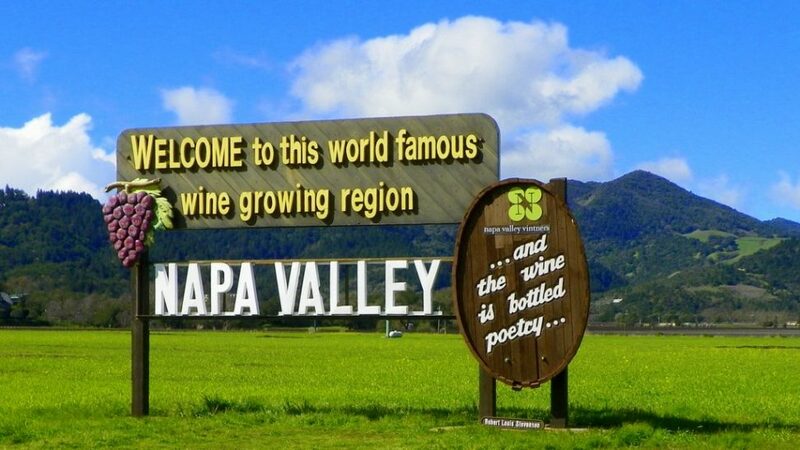 Thanks for looking deep into the US to see there is so much going on, great people and fine wines that winemakers are working hard at crafting and loving what they do !! By the way, last week I had an interesting conversation with the world’s leading wine climatologist, and when I asked for the current wine region he thought would most benefit from global warming, he mentioned Snake River Valley. It’s really a cool and useful piece of info. I am happy that you simply shared this useful information with us. Please stay us up to date like this. Thank you for sharing.